The Admission Ticket will tell you exactly where and at what time to report on the day of the test. It will also contain your personal details. This ticket is your permission to attend the test centre and a printout must be taken with you on the day. Admission Tickets presented on electronic devices will not be accepted. If you present without an Admission Ticket you will be refused entry. Notification will be sent to your registered email address when the Admission Ticket is available through your online account, approximately two weeks before the test date. If your identification document details have not been entered in the registration form you will NOT be able to access your Admission Ticket. Please check your Admission Ticket carefully and contact the HPAT – Ireland Office immediately if there are any errors. The details on your Admission Ticket must match the details on the identification document that you will use on the test day. Only your first and last names are required to match and it is not necessary for your other names (including middle names) to appear on the Admission Ticket. Your other names, if provided when you created your account, will however be printed on the Attendance Rolls given to the test centre supervisors so that they can be checked on the day, should there be any issues matching your Admission Ticket and your identification document. Before you print the Admission Ticket, check that both sides of the print paper are blank; there should not be any marks on your Admission Ticket. Admission Tickets may be printed in black and white; you do not need to bring a colour printout. Please fill in your identification document number and sign your Admission Ticket beforehand and have it ready with you on the test day. Do not write anything else on your Admission Ticket at any time before or during the test or lunch break. 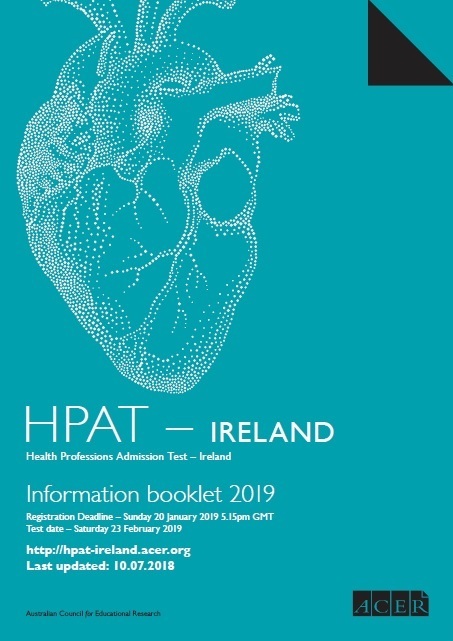 If you have issues accessing your Admission Ticket, you should contact the HPAT – Ireland Office by 20 February 2019. Please do not leave this to the last minute. Remember that you will only be able to download the Admission Ticket once you have entered your identification document details in the registration form.